The Redstone Castle is once again open year-round for tours, overnight stays, and weddings and private events. The mansion was constructed in the early years of the 20th century as a winter retreat for coal mining magnate and “fuel king of Colorado” John Osgood and his wife “Lady Bountiful.” As a member of the social elite, Osgood entertained such notable figures as the Rockefellers, J.P. Morgan, and President Theodore Roosevelt at his Redstone property. The castle has changed hands and transitioned through several iterations over the years, but is now once again open to public visitation as part of a commercial lodging venture. Steve and April Carver, owners of the Hotel Denver in Glenwood Springs, purchased the property at auction for $2.2 million. They spent just over two years working with Pitkin County to rezone it to accommodate their plans for its future, and an additional nine months restoring it. “Renovating the extraordinary Redstone Castle has been an exciting adventure and an opportunity to revitalize this celebrated jewel of Colorado,” said Steve Carver. “Grown men cry when they walk through,” said April Carver, referring to those who have seen the house before the renovations and are then shown the improvements. “We touched every floor, every ceiling, every wall,” she said. There are 11 inhabitable suites completed for overnight stays, according to Carver, though only seven of those will be available for the initial opening. 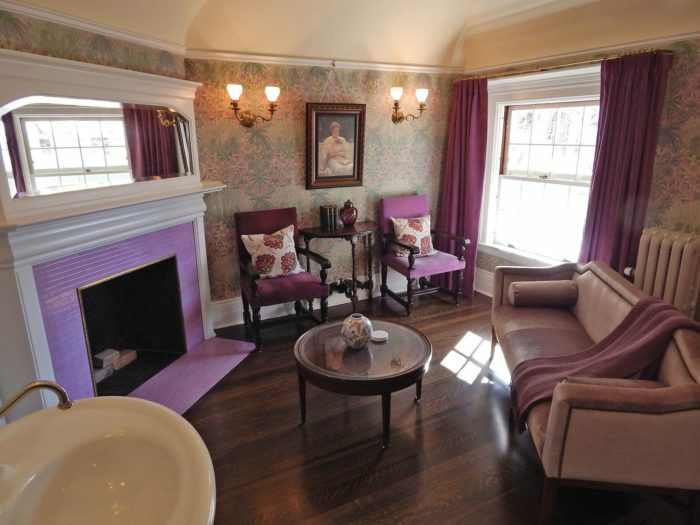 Each suite includes a separate bedroom, sitting room, and bathroom. The accommodations are nothing short of luxurious, yet harmoniously integrate with the historical character of the mansion. Guests can check in at four and will enjoy a reception that includes snacks and wine from neighboring Paonia. They will be given a tour of the grounds and a “famous Redstone Castle hot breakfast” in the morning. An overnight stay includes access to the manor’s trails on 150 acres in the magnificent Crystal River Valley, as well as private fishing along the Crystal River. Suites are currently available for $395 per night at www.theredstonecastle.com. Walking into the castle is, indeed a unique experience. Initially striking is its location, situated in a breathtaking meadow about mid-way up the Crystal Valley. One can imagine that in Osgood’s day, this would have been a particularly challenging location to access. He would no doubt have rarely seen unexpected visitors. The mansion was meant as a winter retreat, built to combat heavy snows and frigid evenings with glowing hearths and lively entertainment. Walking through the ornately decorated rooms, it is easy to imagine the many cultured guests gathering to be revitalized in this remote abode. The Great Room, dining hall, billiards room, and library are just some of the historic social spaces that modern guests can now enjoy. Each suite offers over 500 square feet of livable space. They are all unique with distinct attributes. Names like the Roosevelt Room, Tower Room, and Octagon spark curiosity and intrigue. Some offer stunning views, while others are tucked away in cozy, intimate nooks. They are all heated by steam heat and are up to par with any luxury hotel. When Hotel Denver General Manager Roxie Mallander learned of the Carvers’ intentions, she was overcome with “full blown excitement” as she speculated on what would become of the Redstone Castle she fondly remembered visiting as a child.